Okkk so I may have received a £120 in gift cards from my sisters for my birthday and you best BELIEVE I was shaking with excitement. The voucher took 24 hours to be available in my account, the longest 24 hours of my life – atleast it gave me time to really think about what I wanted… and to see the stuff I did want go out of stock. If there’s one thing I don’t like about Beauty Bay it’s this procedure where you have to wait a day to use a gift card, it kinda broke my heart seeing the Juvia’s palette I have wanted for years go out of stock. There was a 30% off £120 so I took this opportunity and saved £50!!! I basically got the Jeffree set for free. I think the 30% off was an amazing deal and it allowed me to get the most out of my gift card. With that being said, here’s what I bought! First of all the oh so famous “Beauty Blender” now I never even thought I’d own one of these, I was quite happy with my Real Techniques sponge (which I think are AMAZING). Now most people do say “oh they’re just the same” which I genuinely thought too! But they’re not. The Beauty Blender is alot squshier, expands better in water and honestly applied my foundation in like…5 bounces. Overall it just feels like a better quality sponge, and it didn’t soak up as much as my foundation. 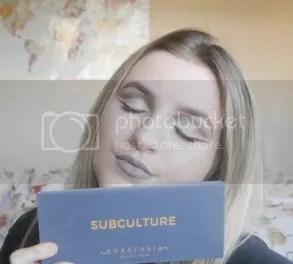 I had the same thoughts about Anastasia Liquid Lipsticks, for some reason I thought “I bet the formula isn’t that great” but boy oh boy was I proved wrong. I have been on the hunt for a wearable lilac and when I saw this shade ‘Clover’ which is described as a ‘Stormy Lilac’ I was like HOT DAMN I need to try this! I’m so glad I took the plunge and tried it. LA girl Pro Conceal used to be so raved about years ago and I’ve legit only just tried it for the first time. It is FIVE POUNDS!!! I don’t understand why people aren’t talking about this!! It’s so fab, cheap, amazing shades and so full coverage!! I love the squeezy tube applicator too it made applying it to my face kind of fun.. (that makes me sound sad). But honestly I’m so happy I’ve found a new, full coverage concealer that is cheap and light enough for my skin tone! I might buy one to contour/bronze with. Zoeva Rose Golden 105 Luxe Highlight Brush for £13 I was like yes please. I only own one Zoeva brush and I love it to pieces so I really wanted to try more especially a face brush. My first thoughts were, ahh so soft, so well made and beautiful. Upon using to highlight it blended it out and added lots of intensity to the highlight I was using, it blended it nicely but I need to try it out more as I felt like the brush was slightly too big for highlighting such a small area like a cheekbone. I might try it for contouring and powdering too! I also picked up the Anastasia Dipbrow in Taupe, and honestly my brows haven’t looked as good as when I got them done by Mac! Literally I can fill my brows in, in less than a minute with this. It’s so pigmented and again, TOTALLY worth the hype and I’m so excited to use this all the time. You really need to try this out. I FINALLY have an Ofra highlighter! I decided to pick up the ‘Beverly Hills’ highlight as there’s technically 5 different shades in one which you can use individually or swirl all together (I wouldn’t want to mess up the gorgeous design though!). – it glows so gorgeously, I can’t stop staring at it! – the formula is super blinding and you barely need to tap your brush in it. – it doesn’t have any talc in it so you know it’s good quality! I’m so excited to use this highlight more and try out the different shades AND i’m gonna use the gold as a eyeshadow – eeeeee! You’re gonna have to wait for the full post on this bad boy, so make sure to follow me! Lastly I decided to pick up the Ordinary serum foundation in the shade Fair 1.1P which I assumed it’s going to be cool toned, fair and match me really well. I think I ordered the wrong shade because it’s slightly orange and I had to mix in my other foundation so it didn’t look silly. I’ve only tried this once but I loveddd the coverage on this. It’s a light/medium coverage which actually covered up my lovely acne but left my face with a healthy dewy glow which is my absolute FAVOURITE thing in a foundation. Honestly for a fiver you can’t go wrong, I’m going to order another one in a lighter shade and I’m going to pick up the full coverage version of this foundation too. What would you recommend from Beauty Bay? omg the highlight looks amazing! I will have to check out that beauty blender! I tried a few beauty blenders in the past that were sooo stiff. That anastasia liquid lipstick is a gorgeous colour!